DUNDAS, Ont. -- Kraft Hockeyville is a familiar experience for the Buffalo Sabres and the Ottawa Senators, but that doesn't mean it's any less special this time around. "It's fun to be out there. I was fortunate to play in Roberval too," said Sabres right wing Jason Pominville. "I see myself as a kid, to be able to see two NHL teams come to my city and play a game would be pretty cool and pretty neat. It's always fun to give back and I think this is a great way of doing it. It will be an interesting game as well." The smaller ice surface is just one of the things that make this Kraft Hockeyville game interesting. A regulation sized NHL rink is 200 feet by 85 feet, while the J.L. 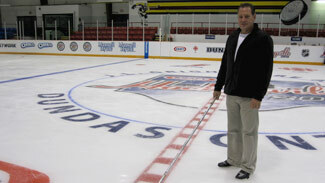 Grightmire Arena's ice surface measures 190 feet by 80 feet. "It's tight. 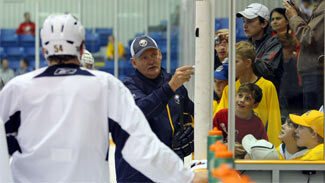 I told the guys it’s a different type of game," Sabres coach Lindy Ruff said. "I told the guys we'll be able to see battles in small places. It will be tough to get the puck to the net. There's not a lot of room to make a lot of plays, so you're going to look at different aspects of the game." For Chris Neil, who played in Salmon River with Ottawa in 2006, the smaller rink is a blessing in disguise. "It plays into my game," the Ottawa forward explained. "That's what got me into the NHL and that's what keeps me in the NHL, so I think I’m looking forward to getting out there." His teammate, defenseman Matt Carkner, was a little concerned about the faceoff circles. "The hash marks were into the boards, I don't know if we'll get kicked out a lot of the faceoffs," Carkner said. "It's definitely a smaller rink, but it's going to be a high-paced game, and they'll probably be a lot of hits. I don't know how the puck movement will be, but it will be fun, it will be energetic." Neil's experience at Salmon River gives him an edge on some of his younger teammates and perhaps a better understanding of why he's here. "It's great. Anytime you can be part of something like this, it's great for fans to come out and enjoy it, especially when they normally wouldn't get a chance to see NHL players and interact with them and be that close," Neil said. "For us it's just a great experience as well, how they treat you, how they recognize you. I think it makes you very humble, for sure." The fans gave the players quite a welcome Tuesday, as many from the community of Dundas showed up in the pouring rain to great the team buses, a once-in-a-lifetime opportunity for most of them. Buffalo defenseman Tyler Myers stood out in the rain with the crowd and signed every last autograph that was asked of him. "We know this was a pretty big event for this town," said the 2010 Calder Memorial Trophy winner. "It was nice that it's important. When we rolled in, it was nice to see." School children were also in attendance to watch the morning skates. Brad Crewson brought his three nephews, Mason, Carter and Trenton Baker to the rink. "They all love hockey, they all play hockey here," Crewson said. Besides catching pucks, the boys also enjoyed dancing with the Senators mascot, Spartacat, and 9-year-old Carter was especially happy to be skipping school. For Ruff, this game not only brings back memories of Roberval, but it brings him back to his youth. "Considering I'm from a small town, it's great to get back to small rinks again," said Ruff, who hails from Warburg, Alberta. It also brings back memories of the meals he devoured as a kid. "The first thing I think of is Mac and Cheese when you mention Kraft. I think every hockey player grew up on a bit of Mac and Cheese," Ruff said. "You think of Kraft, hockey, Canada and a small building and a game and it's our opportunity to do it twice. I don't think we'd ever thought we'd be back in a game like this." In this year's Kraft Hockeyville, the Sabres decided to bring some of their star players like Ryan Miller, Thomas Vanek, Myers and Pominiville. "We're going to try to put the best show on that we can. The people that are in this building are excited to have us here," Ruff said. Show or not, there are still players on both teams who are jostling for roster positions, but they realize this game is still for the kids. "I saw a few of the young kids out there just staring off," Carkner said. "It's pretty amazing to get to be part of the NHL and to get to be part of these kids' lives, to see the excitement for hockey and to see that they really respect the game."